Did you know Portsmouth is the UK’s only island city, which lies on Portsea Island? I am always shocked by how many people don’t realise Portsmouth is in fact an island! Having just finished a year’s placement at GE Healthcare, this will be my 3rd and final year at The University of Portsmouth studying Business Enterprise Development. It feels great being back and I am very much looking forward to making the most of my final year as a student; although it is scary thinking this time next year I could have graduated! I was slightly anxious returning to university after a placement year, knowing a lot of my friends would have already graduated and moved on. However, I instantly became more comfortable about the year to come, as I attended the placement awards evening, where I recognised many familiar faces. After the initial presentation we were given the opportunity to catch up with each other, in an informal environment, and share all our stories and experiences from our year in industry. The event was a great idea and really put me at my ease. University aside, sport plays a big part in my life and I’ve decided to run ‘The Great South Run’ this year. I have given myself the target of completing it in 70 minutes…wind direction permitting! On Saturday 26th September, as part of my training, I went along to ‘Parkrun with Sandi Toksvig’ (The University’s Chancellor). It was a brilliant morning with over 200 students/ staff providing a sea of purple. The weather was stunning providing some great views along the seafront – as you can see in the images below. Although I didn’t run a personal best, on this occasion, it was still a thoroughly enjoyable morning. It was great to see everyone encouraging each other. I will definitely be going next week! For those who don’t know, Parkrun is a timed, 5-kilometre running event that takes place at 9:00am every Saturday morning, at many venues up and down the country. It’s a very relaxed event with a whole range of abilities attending from competitive runners to leisurely walkers, who just want to get fit. For anyone who is thinking about getting fit or starting running, I would really recommend giving Parkrun ago. 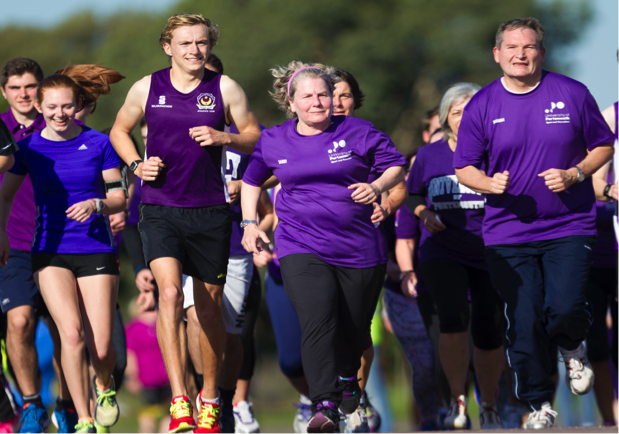 This weekend Parkrun celebrates it’s 10th anniversary and the best part is it’s free! On reflection, it has all been very positive and I’m looking forward to the rest of my year. ← Summing up the first few days !